The first 90 days: according to plan or a plan forgotten? Have the first 90 days of the new PLP government shown that they have a plan and are credibly executing on it or has it seemed like the plan is forgotten? Premier Burt has been busy on US and European tours promoting Bermuda. Meanwhile at home, each minister seems to have different priorities, rushing to make progress and implement change. In the midst of this, the PLP’s original 100 day pledges seem to have been forgotten. Is there a steady hand guiding the direction of the Bermuda government or is it a free for all where everyone does their own thing? If there is no plan or the plan is ignored, what does that mean for our future? Premier Burt has been busy selling Bermuda externally and ensuring we’re on the right page for important issues such as our OECD rating and have a voice in Brexit. This is absolutely applauded as we need to ensure we send the right message to our international community. He has also been busy promoting Bermuda to potential investors in hopes that we can reignite real growth in our economy. In Bermuda ministers have been racing in the first 90 days to deliver changes. While some have certainly been welcome, the pace of it has at times seemed rushed and not well thought through. Each minister seems eager to deliver but the direction seems lacking in guidance and structure indicative of an overall plan. As a result we’ve witnessed a series of gaffs that risk damaging the island’s reputation and sending the opposite message than what the Premier has been trying to send with his tours. The prospect of independence being raised at an inopportune time may have cooled investor enthusiasm. “Bermuda is more than golf, rugby and sailing” which seemed to discount the valuable contributions these activities make and the rumor that America’s Cup was referred to as a “Mickey Mouse Event” on the Sherri J show by Tourism Minister Jamahl Simmons just as the prospect of hosting future similar events is bubbling. The seemingly endless stream of “unfilled budgeted positions” now being filled without clear evidence of how they’ll be paid for and how we’ll possibly balance the budget with an expanded civil service. The rushed tabling of the immigration reform bill which looks to basically remove consideration of any non-constitutional human rights protections on immigration issues. This certainly doesn’t look good from the outside looking in. So it can’t be said that nothing is happening, but what of the PLP’s plan for the first 100 days? Has it been forgotten? 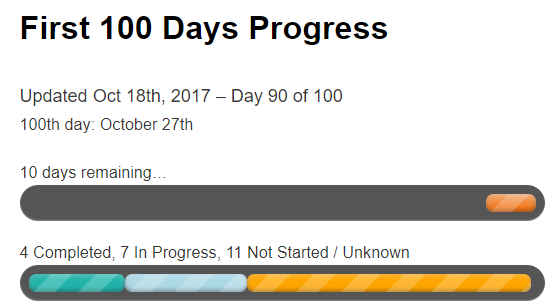 Thus far only 4 of the 21 pledges of the PLP’s first 100 days have been completed with only 10 days remaining. Some of these likely just need a communications update so it is rather surprising that they’ve seemingly been forgotten about. Others have shown progress and likely are on track but communication on progress is lacking. Others still, such as the good governance pledges, have been concerning in their mysterious absence from being mentioned since the election. The PLP made a plan to complete these pledges in the first 100 days. Having completed so few and paid so little attention to it in the first 90 days is discouraging and not exactly a great omen for our future. Protectionist populist notions seem to drive the PLP’s agenda which can be good for short term political gain but disastrous for long term growth. To their credit, the PLP have quite a few ideas in their Vision 2025 but they are short on details and feasibility when implementation is the hard part. To lead effectively, you have to do more than come up with the idea. You have to execute on it. Execution of ideas is where the PLP struggles. The lack of progress on the PLP’s 100 day pledges in the PLP’s first 90 days is a tremendous concern for what it says about the next few years. Execution of ideas is essential. Having well thought out plans to do so is essential. Following those plans and communicating progress at every step of the way is essential. Having everyone coordinated and working from the same page of the plan is essential. We haven’t seen evidence that this is happening. Premier Burt is admirably selling Bermuda off island as a modern, progressive, world leading place to do business while at home we’re sending out messages that counteract his efforts. It leaves one to wonder where is the steady hand guiding the direction of the Bermuda government to ensure we have a plan and execute effectively on it? This entry was posted in Uncategorized by DenisPitcher. Bookmark the permalink.